A. Arnold Gillespie book about special effects, matte painting, in-camera affects and the MGM backlot. People of interest are Warren Newcombe, James Basevi, Yuricich, Harold Wellman, William Wyler, John Bossart, Max Fabian, Clarence Slifer, Mark Davis, Harold Lipstein, Harold Marzorati, Ed Snyder, Virgil Apger, Kenneth Bell, Eric Carpenter, William Creamer, Miton Gold, Eddie Hubbell, Frank Shugrue, and Jimmy Manatt. "You can't make miniature water. And you sure can't make miniature fire" espoused A. Arnold "Buddy" Gillespie in his memoirs. The MGM Special Effects team tasked with BEN-HUR (1959) were challenged with both of these elements. The classic BEN-HUR (1959) movie epitomizes the craftsmanship of writing, directing, miniatures, and editing coming together. 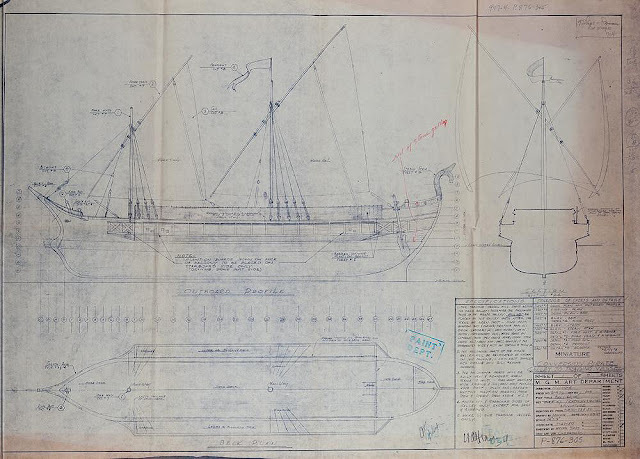 Inspired by David's Model Ships in Cinema Ben-Hur tribute blog, this entry combines the working script, behind the scenes photos, and diagrams from the collection of A. Arnold Gillespie. Additional diagrams and photos contained in the memoirs of Buddy Gillespie, titled "Wizard of MGM", provide insight into the planning of each shot. This blog touches upon the masterful work by the MGM studio; effects, painting, woodworking, Art Direction, and cameramen. The Roman fleet initially appear in scene 156 as silhouettes. The larger scale Roman trireme 1/6th scale (2" to the foot) are revealed subsequently, The direction and placement of each radio controlled, cable guided, galley is carefully planned by the Art Director, A. Arnold Gillespie. Using radio signals, catapults, arrows, oars, and seamen moved on command. Queued just out of frame, spring loaded and battery powered action was initiated. Arrius's vessal, painted white, leads the fleet. Shot in August of 1957, filming was intermittently delayed due to weather. 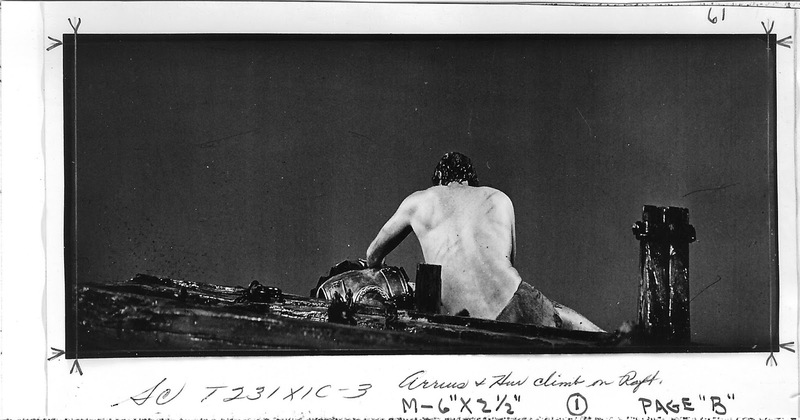 Scene 156, the introduction of the Roman fleet, and scene 236, as Arrius and Ben Hur raft afloat see a ship on the horizon, were shot on the same day, August 20th, 1957, using profile ships. Note the similar cloud formation painted on the backing of Tank Lot 3. Perhaps the top of the long shot, scene 236, is a matte painting. Shoreline silhouette was added as the barren shoreline of Judea for Scene 260, also shot on the same day. The background shot was flipped apparently to provide more open sky behind Charlton Heston. 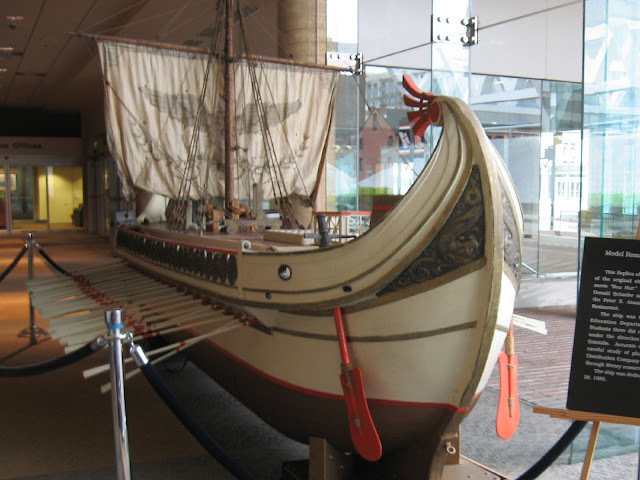 Arrius's trireme, identified by the stern's plume, was restored by the Baltimore Vocational Education Department. Proudly displayed in the Baltimore Convention Center main lobby, the vessel measures 20' 6" bow to stern, 4' wide and 10' 10" tall. 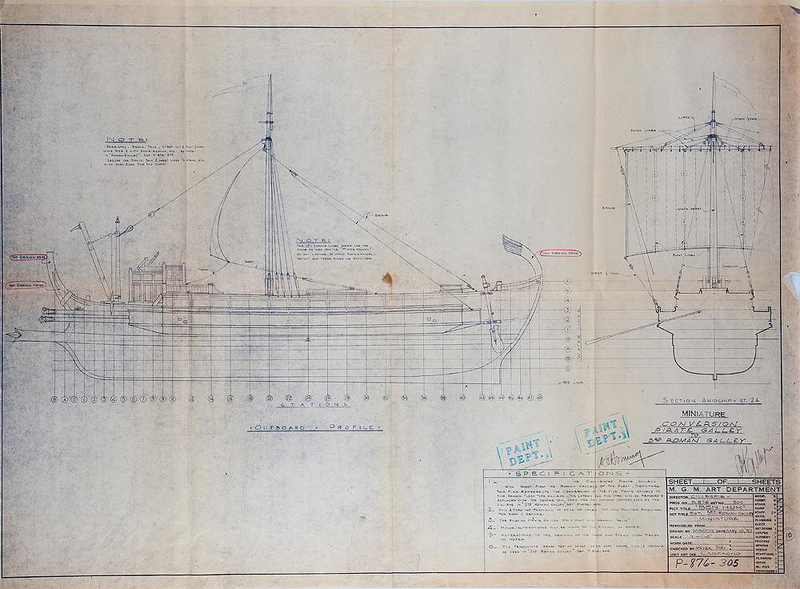 Being 1/6 scale, the full size galley would have been 123' long, 24' wide and 65' tall. Shooting finished on November 18th, 1957, with a total cost of $441,603. Galleys, profiles, rubber crew and special effects construction totaled $181,515. (See cost sheets posted at the end of this blog). Note the eye hook for the cable pully attachment at the stern, used to control movement of each ship. Eye hooks were installed at the bow and stern to control fore and aft movement. using both sails and oars. As shown in a previous frame still, ten Roman galleys cross the 75mm Ultra Panavision camera for scene 203. Eight galley silhouettes accompanied the ten Roman ships. The images were made from photos of the miniature galleys as required for proper angle and height to tie in with the three dimensional ships. Height and percent from bow right are detailed in the schematic. Cables pulled the galleys across the miniature sea. Rigging location for cables are calculated. Careful attention to the deep pit was made so a distracted effectsman would not fall into the pit. At 3' per second, the 11' galleys total travel time for this shot was only 4 seconds. Art Director Edward C. Carfagno illustrated each scene, including Sc. 203, Arrius' Galley Joins Fleet - Day. This miniature shot is recycled for Scene 205X1 and several others. Note the cloud formations are the same as viewed through the second camera. A slight flaw with this quick clip is that Arrius appears on a ship in and along side his own white, eagle emblemed, vessel. Arrius comes up on deck, looks at the pirate fleet in the distance. To reduce production cost, galleys were converted from Roman trireme to Pirate galleys and back. Shooting was scheduled to accommodate redressing. Five of the ten ships constructed played dual roles. From August 8th, the first day of shooting, to September 18th, all ten ships were Roman. On September 18th, five of the galleys were converted to Pirate ships for scene 210 and beyond. 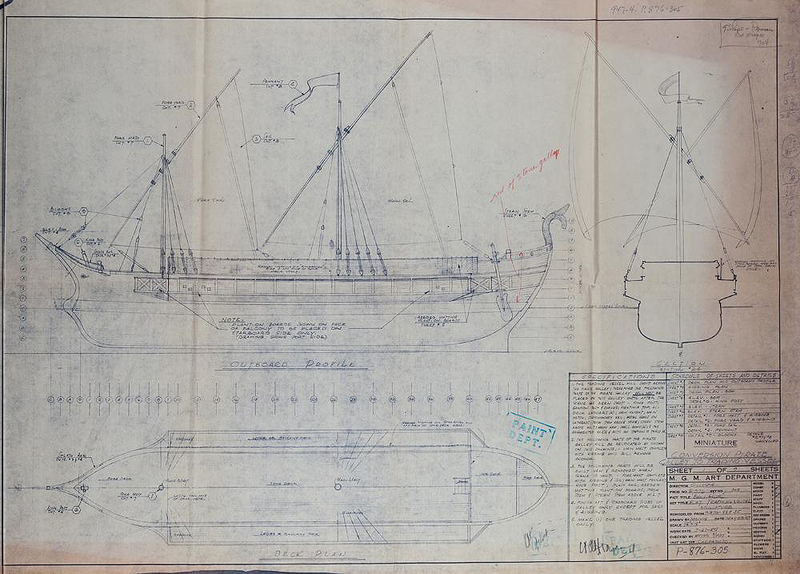 The second diagram below states "CONVERSION PIRATE GALLEY TO ROMAN GALLEY", directing the Paint Department to apply the conversion of the Roman vessel to Pirate. Tank Lot 3 backgound also had a makeover. Dark clouds with a red dawn on the horizon provides contrast for flares and fire balls. Note the camera tilt down in the initial battle scenes, versus the tilt up, camera closer to the water line, emphasizing ships and hiding the red dawn in later scenes. (See photograph at the end of this blog for camera rigging reference). A pivotal scene known by the "ramming speed" quote, provides insight into the use of miniatures and background. Shots are frequently re-used as both foreground action and background, combined with live action. Scenes 220 and 231 showcase how proper planning, writing, and flawless execution come together. Camera angle, height and stability are carefully calculated. The slaves are frozen with terror. We're going to be rammed! Scene 222 B.G. (background) - Each scene is diagrammed, specifying speed of the Roman and Pirate ships, camera lens, and film speed. Ship speeds are carefully planned to approximate full sized ship travel, taking into account film speed. Art Director's schematics detail placement of the ships in Tank Lot 3. CL (center line) of the tank backing and feet from center are calculated. Every 10' are marked. Romans are identified by "R", Pirates by skull and cross bones. Cameras were floated in the turbine and drum whipped waters to transport the viewer into the scene. Shot 11/5/57, Delayed due to weather. XL, XLI and XLII are 40, 41, and 42 respectively. Rowers' oars are positioned at a 20% angle from each other. 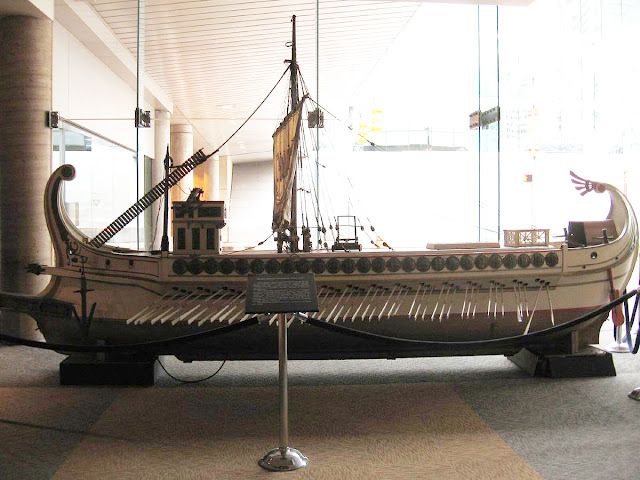 The photo below of Arrius's ship at the Baltimore Convention Center, bow (front) on left, shows the oar hole placement. Signal flares raising high above the Roman fleet hailed the beginning of the battle. Shot in August of 1957 in Tank Lot 3 at MGM in Culver City, nine of the 10', 2" scale, galleys plus three reduced scale profiles were used in this shot. 104mm and 50mm lenses captured the action for foreground and background scenes. ship to ship, signaling the order to attack. 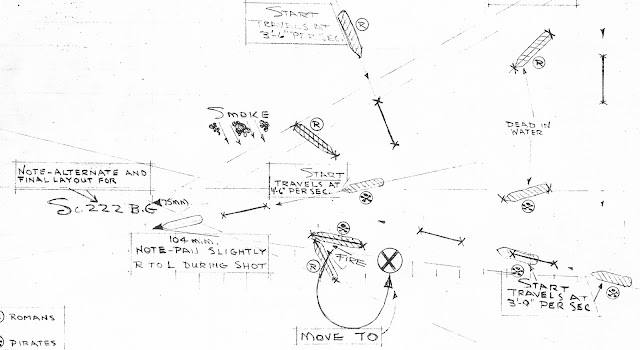 Edward C. Carfagno's rendition of Scene 210, signalling the battle begins. Arrius's galley circles to sideswipe Pirate galley. Two Pirate ships engage Arrius's trireme. To avoid miniature men seeming static, the rubber figures were cast with flexible wire armatures for "positioning". 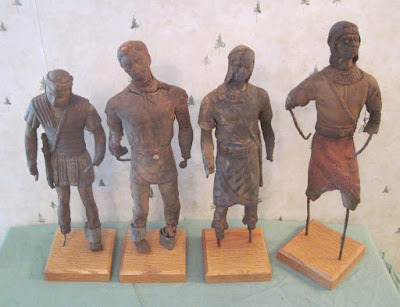 Some miniature men were mounted on coil springs. Others "walked" about the deck on motorized pulleys. 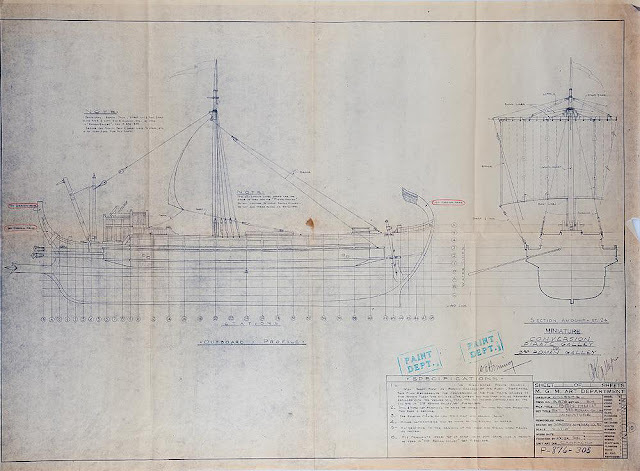 Edward C. Carfagno's storyboard for scene 220X17 directed the sales to be furled (rolled up and secured). deck. Some of the fire spills over the side. Miniature Pirate ship, post ramming, as miniature rubber Romans lower ramp, preparing to board the severely damaged vessel. In December 2016, some of the miniature rubber slaves, Romans and Pirates surfaced for auction. Originally obtained at the 1970 David Weisz MGM Auction In California, the figures stand approximately 11" tall. water pours in, swiftly flooding the cabin. The miniatures in the battle scene were not the only rubber men created. Scene 223 introduced two rows of full size rubber slaves, impacted by the ramming Pirate galley. The set, built on a gimbal, tilts as water rushes in. It is ablaze and starting to list. consciousness. He looks dazed PAST CAMERA. Note the re-use of the same shot from two different cameras; 75mm and 104mm lenses. Black and White photos of background and foreground prior to being optically combined. The blue screen chromakey method of combining shots, called out in the script, retained the blue glow of foreground activity. Note the similarity between the foreground action scene and the background blue screen scene. The blue screen traveling matte method replaced rear projection in the 1960s. While used widely, it was not perfect. A strategically placed fireball can be seen traveling across Arrius's helmet and in front of the mast rigging. Background for this shot in the 220X series is the arrow exchange between Arrius's trireme and the Pirate galley as shot by the second camera. fire balls from Pirate ship hitting galley. The sinking of Arrius's galley, as dramatic as any death scene, begins with a slow decent. Underwater cables, controlled by on-shore pulleys, drag the vessel downward into the "sea". The bow, or front, is the last to go, as if gasping for a last breath. Oars wave violently as slaves attempt to signal for help. Debris and floating miniature men are swept by the descending ship. MGM's Tank Lot 3's deep pit, outfitted with pulleys, controlled the ship's decent. Cable "C", pulled at 2.4" per second, resulted in a total of 30 seconds for the ship's demise. Measuring twelve feet to thirty feet in depth, three hundred wide by three hundred feet long, with three deep pit wells ranging in size from twelve to thirty feet deep, MGM's Tank Lot 3 provided the effectsman to deliver miniature and full size effects. Due to editing, Arrius's sinking ship is played out twice. Edited between the battle and raft scenes, one will notice that two ships sink. Both are Arrius's. The above still, shown during the battle scene, precedes the last shot of the sequence, below. Editing the scenes chronologically, the sinking of Arrius's trireme is revealed. The MGM Effects Department captured Edward C. Carfagno's visualization of Scene 230 fairly accurately. As directed "Miniature Sinking Roman Galley (Arrius) Battle in B.G." Filming the galley sequence enlisted the collective crews from many departments. 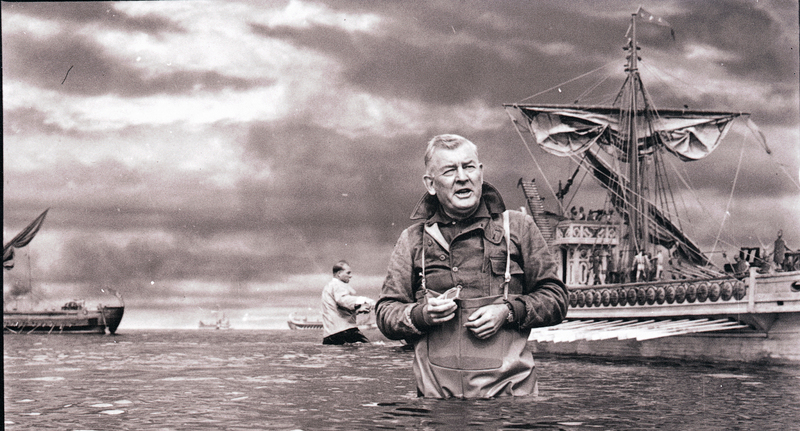 Outfitted in waders, cameramen, lighting, effects craftsmen took to the waters on the backlot. Cinematographer Harold Wellman oversaw shooting of all miniature scenes. The long shot on the right required the cameras to be approximately 250' from the horizon. Twenty ship lengths, 220', separated the Roman trireme, foreground, from the Pirate galley in the background in the photo on the right. MGM accountant Kieth Gledhill tallys the shooting and effects costs. Insight into the shot planning is gleaned from the dates documented. Shooting ran from August 8th to November 18th, 1957. Gross film footage shot was 41,370'. 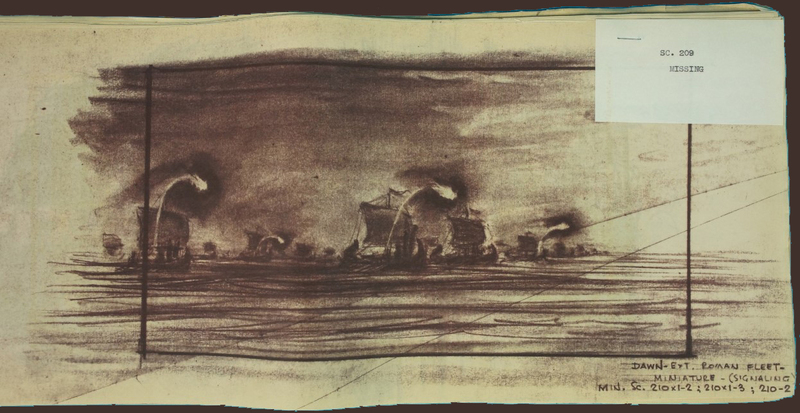 Scene 210, SIGNALS FOR START OF BATTLE, required 11 days for preparation. As this was the first scene for the battle sequence, additional time was required to test ship speed, radio controls, wave height, smoke and wind movement and film speeds. 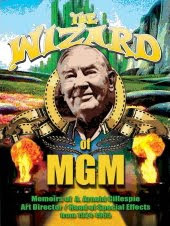 This epic film was a pinnacle event for MGM. With a budget of $15.175 million dollars, BEN-HUR was the most expensive film made to date. It is no wonder that due to the MGM effectsmen, which included carpentry, plaster, rubber, sound, and careful planning, won an Academy Award for Best Special effects. For more insights into BEN-HUR and other MGM blockbusters, peruse the pages of Wizard of MGM. "Ben-Hur: Inside the Script" ebook is available for Kindle, Nook and on iTunes. The Warner Brothers "Inside the Script" series contains the entire working script. As Buddy Gillespie espoused, the more you learn, the more you will apply what you know. This blog is devoted to the practical effects artists and those of us who appreciate the lost art of in-camera effects.